Every day, we engage in some habits that make our skin and overall health suffer, aging us in the process. From the food we eat to the way we wash our faces, these habits can end up making us look years older. 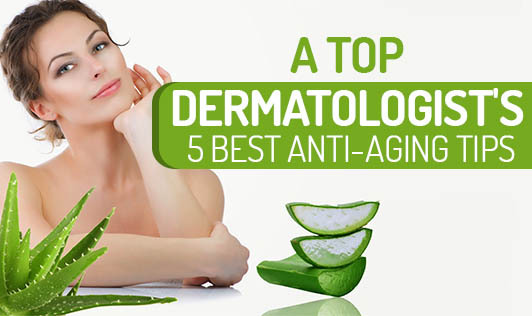 So, to help you out with this here some anti-aging tips from the top dermatologists that will actually make a difference to your skin. 1.) Wash skin with the tap water in the morning; cleanser is not necessary. Most people believe they need to exfoliate and deep cleanse, but in fact in the morning (when the skin needs to shield you against the toxins and pollutants of the day), maintaining a healthy and intact skin barrier is key to good skin. You will see the difference: less inflammation and fewer breakouts. 2.) Do not use hot water to wash your face. As the hot water touches the skin, it heats it up. In an effort to cool it off, blood vessels dilate (the skin turns red), and the water evaporates in an effort to release heat. This mechanism is known as evaporative cooling. So, only use lukewarm water for washing your face. There should not be steam on your medicine cabinet mirror! 3.) Immediately after washing, while the skin is still damp, apply your moisturizer. This locks in hydration before this evaporative cooling is allowed to occur. 4.) Beauty sleep is very important. Key hormones are released during late-stage sleep, such as growth hormones, that stimulate skin cell production and collagen synthesis. A decrease in protein breakdown occurs as well. In other words, this surge of growth hormones repair the skin and gives it luster. A minimum of 7-8 hours of sleep hours is needed for most people to have completed all stages of sleep. 5.) Good skincare products are critical and well worth the investment. You need to give your skin the tools it needs to protect and repair itself. If you provide the skin with the right ingredients, you’ll save in the long run by not needing lasers, injectables, or surgery. To keep your skin and body, rejuvenated, there is no better way than going natural and using safe, chemical-free solutions to give you the youthful skin you desire in the comfort of your home.